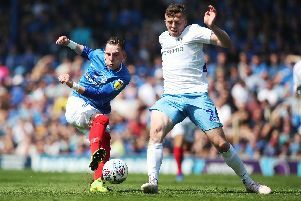 Mason Mount has toasted victory at Old Trafford – a decade after visiting as a Pompey fan. The former Purbrook Park pupil yesterday netted Derby’s opening penalty in their Carabao Cup shoot-out success over Manchester United. Earlier, Marouane Fellaini’s 95th-minute leveller thwarted Frank Lampard’s Championship side from securing a memorable triumph during normal time. That ensured the match finished 2-2 – prompting attention turning to spot-kicks. Midfielder Mount stepped up first to produce a composed finish, with penalties continuing until Phil Jones missed to hand the visitors an 8-7 success. In the build up to the game, Mount’s dad, Tony, Tweeted a picture of the youngster from a decade earlier, wearing a Pompey top and inside Old Trafford. The 19-year-old has scored five goals in 11 appearances for Derby after joining on loan from Chelsea.